GALION — Students at Galion St. Joseph’s Catholic School are taking part in a new fitness program this school year as a part of their school Wellness Program. On Thursday mornings, students gather for their morning prayer as usual, but also get geared up for the day with some breathing exercises and fun movement time to get their blood flowing before heading to their classrooms. The response from the kids had been a positive one. “When the students return to their classrooms after their morning exercise, they have a nutritional worksheet to work on also,” said Food Services and Wellness program leader Jennifer Johnson. Johnson also has plans to expand the new food “Try It Day” after the beginning of 2019 with choices that are more unusual than she has introduced so far. Erin Miller | Galion Inquirer Students at Galion St. Joseph’s Catholic School are participating in a Wellness Program that incorporates good food choices as well as exercise one morning per week. 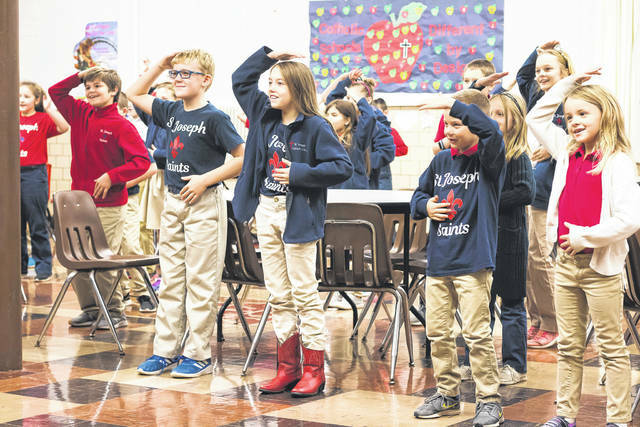 https://www.galioninquirer.com/wp-content/uploads/sites/38/2018/11/web1_IMG_0911.jpgErin Miller | Galion Inquirer Students at Galion St. Joseph’s Catholic School are participating in a Wellness Program that incorporates good food choices as well as exercise one morning per week.